Here’s one of the vintage Joe Maniscalco illustrations I have re-purposed. I wonder what they were used for originally. They are masterfully painted in the hey-day of illustration. Dessert in those days was about creating love to share. But today all the recipes have to be made from non-white flour, all organic, mainly proteins, with all the alternative flours. Your caption still hurts little girls. 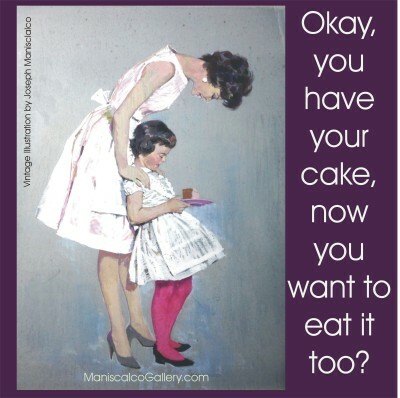 “Here’s your all organic, no artificial sugar, non-flour, cake, sweetheart” Not so funny though… think this one over and ask your daughter & wife what the caption should be. I like it. It needs a little kicker at the end, though. How about, “Enjoy Eating Healthy: Here’s your all organic, no artificial sugar, non-flour, glutten-free Vegan Cake, sweetheart. A little kicker for sure …. Let it ruminate.